You are a seasoned archaeologist who is competing against your colleagues to find the most Scarabs relics. These golden beetle amulets are extremely valuable as they can help solve ancient mysteries about the long-gone civilizations that created them. They are known to be scattered across the world: buried in the Egyptian desert, hidden deep in the Amazon rainforest, immersed in the Bermuda Triangle, and frozen in Antarctica. To find them, lead your team on an expedition to set up camps and mark out areas of excavation. 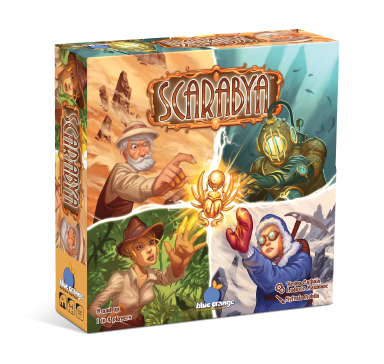 Will you be the archaeologist who finds the most Scarabs and uncovers the mysteries of Scarabya? In this clever puzzle game, the goal is to position pentomino tiles to create zones of 1 to 4 squares, that contain scarabs. Those scarabs are worth the size of the zone they are in (1 to 4 points). 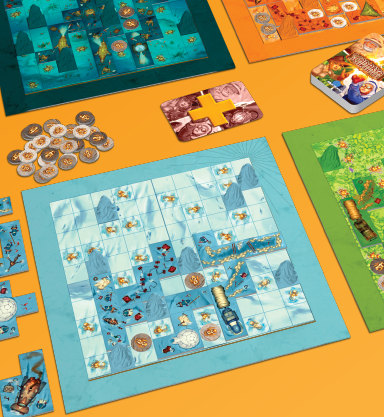 Each tile is placed simultaneously by all players on their individual board, in the order they are drawn. 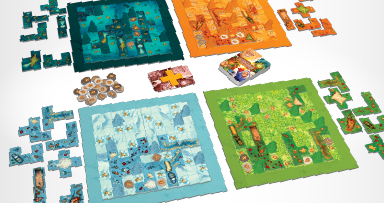 The player with the most points after all tiles have been placed or discarded, wins the game.